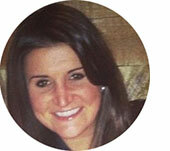 Becky Koons is a Senior Resident Services Manager with AHC Inc. at the Woodbury Park Community Center in Arlington, Virginia. 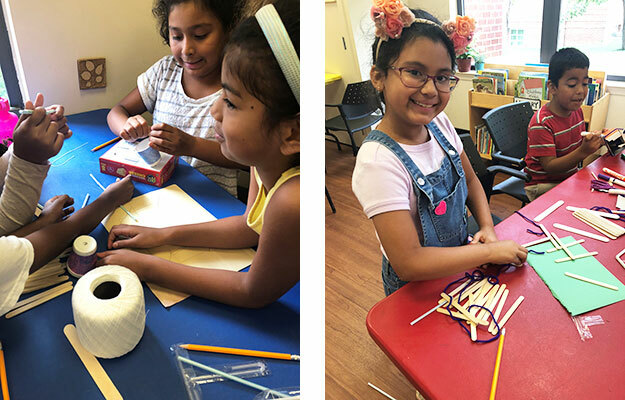 AHC’s Summer Camp program is designed to prevent learning loss — a particular challenge for low-income students — through both educational and enrichment experiences. Becky believes there is not much better than sitting on the beach with her toes in the sand getting lost in a good book. 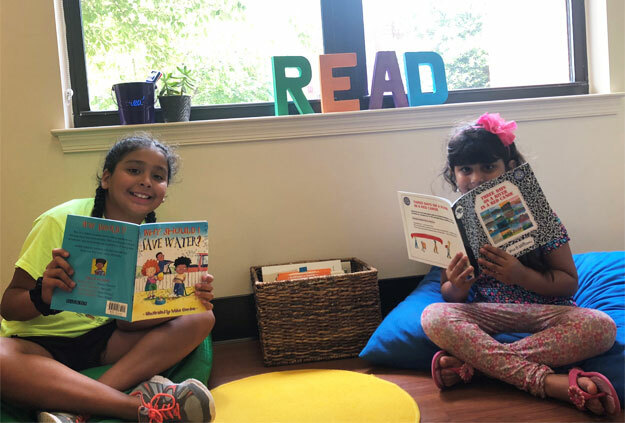 One of her favorite things working with youth is to watch the excitement and happiness on her students faces when they have found a book they really enjoy! My name is Becky Koons and I am a Resident Services Manager with AHC Inc. in Arlington, VA. Every year we host a 6-week Summer Camp program for elementary school students in our community. 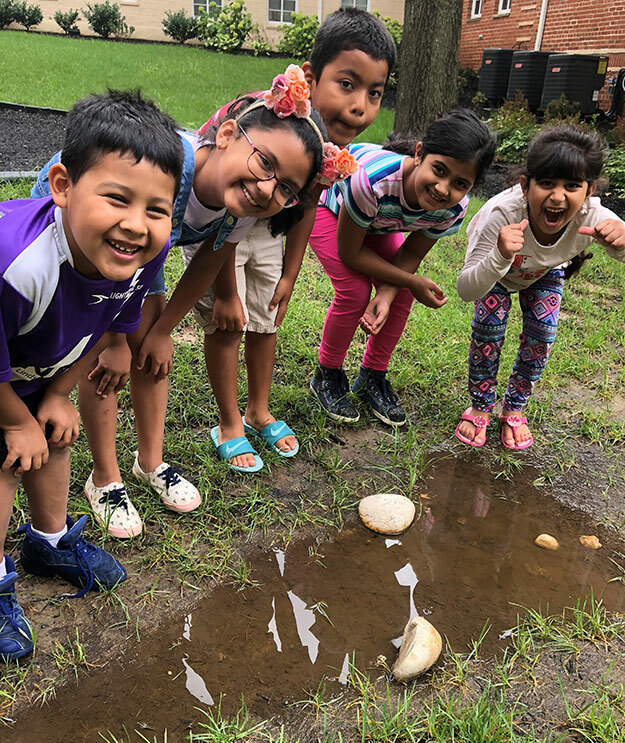 We are beyond excited to have access to the River Rangers curriculum this summer, and cannot wait to share a few of our experiences with you! Although we facilitated the activities in order, I am skipping around to show you some of our favorites! With all this rain in the weather forecast this week, how can we not talk about water?! We started off the day learning new vocabulary words like “conservation,” “wells,” and “aqueduct.” We discussed sources of water in our community, and around the world. We moved on to the importance of water, ways to save it and make it clean. The students then worked on the “A Day Without Water” worksheet activity. We noticed many puzzled faces as the students tried to imagine waking up one morning, attempting to turn on the faucet to find out there was no more water left in the world! We brainstormed what our day-to-day routines would look like if we didn’t have access to water, what would happen to our environment, and most importantly — what would happen to our pool days each week? They used their creativity to explore this imaginary water-less world. 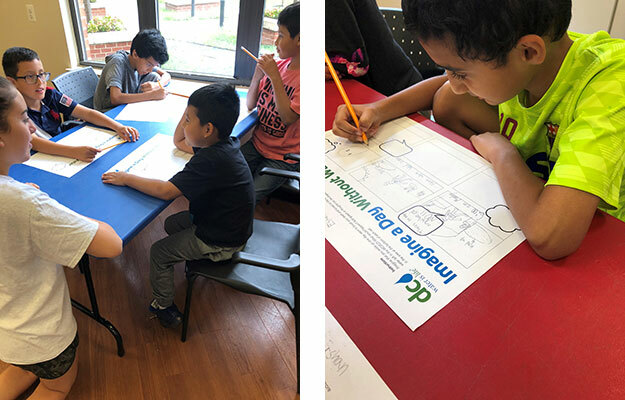 In their stories, the students created scientists to invent a water alternative, superheroes to save the plants and wildlife, and time machines to travel back in time and bring water to the present day. Throughout the rest of the day, side conversations between students at lunch tables and in line to the park, consisted of what if we actually did not have access to water today? It was eye opening to everyone to brainstorm how much our environment depends on water (and how much less rain we would have this week without it!). Raft building and float tests! Another day I wanted to share with you is when we focused on the unit People on the River. We started out reading the book Three Days on the River in a Red Canoe by Vera Williams. Our students were hooked on the exciting adventure the main character had with his mom, Aunt Rosie and Cousin Sam. We want to plan our own canoe trip! The students had water travel on the brain! We split up into groups to participate in the Craft a Raft activity. 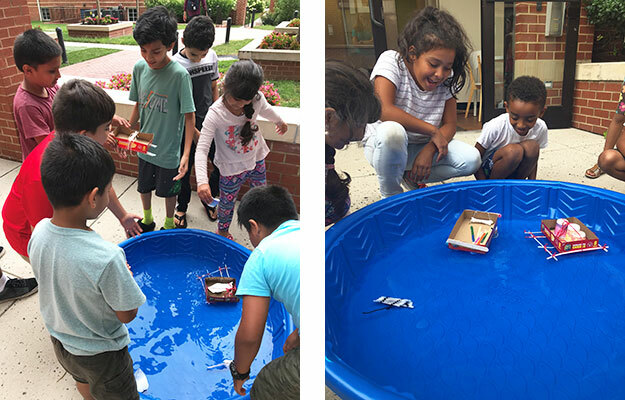 We tweaked the activity slightly (without having much access to sticks from the woods) and the students worked together using popsicle sticks and recycled materials from the Community Center to create rafts that would float in our very own river (a giant blue plastic baby pool). We practiced our new Water Words vocabulary including: “canoe,” “kayak,” “raft,” and “paddle board,” to describe our work. The students had a blast! After working in teams to build their rafts, we put them to the test! It was so fun to see what strategies worked, areas that could be improved and which rafts floated and stayed afloat the longest! Ever since we started the River Rangers curriculum, I have watched the student’s interest and knowledge grow. They have become so much more aware of water in their community. Where does is come from? How can we protect it? Who or what is impacted if it suddenly disappears? We are so thrilled to be involved in this program this summer, and cannot wait to have our students walk away with their official River Rangers Certificates! Thank you to DC Water for permission to use their A Day Without Water activity sheet in our River Rangers toolkit.